The latest advances in medical laser technology have transformed the treatment of thread veins and facial veins in particular. Previously, treatment tended to focus on use of injections to break down the visible and unsightly thread veins. However, this treatment is better suited to larger areas and less well-suited to the delicate facial skin. The advent of laser means that tiny red or blue thread veins, including broken capillaries and telangiectasia, can now be quickly and effectively treated using this advanced technology. 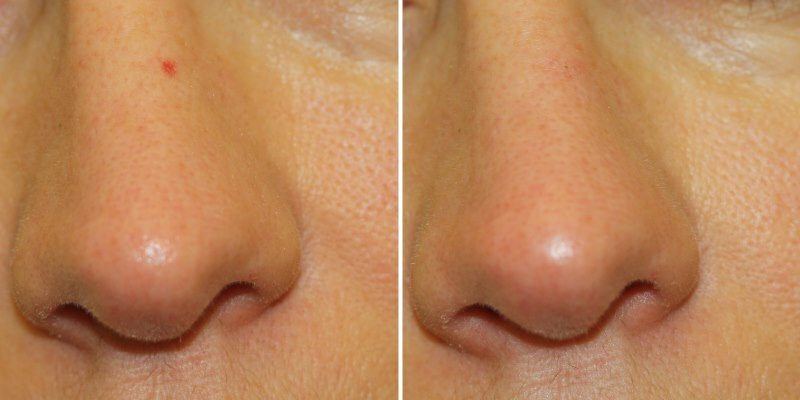 Laser can be used to cut, vaporise or coagulate by targeting tissue which absorbs laser light. It is versatile and powerful, yet can be controlled and used with great precision when it comes to treating tiny little vascular lesions. Laser light has some quite specific properties which make it suited to treating thread veins. It has a single wavelength which can be precisely directed and is non-ionising, making it safe for skin treatments. The laser is set to a wavelength which will be absorbed by the thread vein, heating it so as to cause permanent damage. The surrounding skin is not affected – the laser energy works within the skin by selectively destroying the target thread veins while leaving the skin intact, as the darker coloured thread veins absorb the laser energy while the surrounding lighter tissues do not. Once the veins have been broken down, they quickly fade away, being broken down by the body’s own processes while blood flows through alternative and healthier routes.